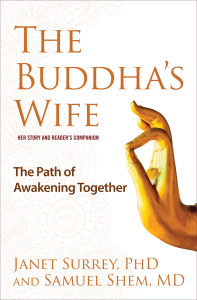 The Buddha’s Wife offers readers inspiration and resonance with our own contemporary lives. Suddenly, in many different arenas— from the therapeutic community to the peace movement to the “green”/environmental movement—the idea that living into our con­nectedness is what heals and empowers is increasingly understood. Such a vision honors and articulates the power and perils of Yasodha­ra’s path of freedom, aliveness, and spaciousness within relationship, and the way between the entrapment of isolation and the fear of being fettered by connections—between attachment and detachment. Especially in these auspicious times of great change and uncertainty, her path provides a way to move from suffering in isolation into building true community, healing, wisdom, and service. We believe that living together in such a way—in the fullest sense—is healing, even transformative. In The Buddha’s Wife, we lay a new foundation for the work of our lives: relational practice, both close at hand and in the larger world. There is the possibility of a fully realized meditative path to awareness in relationships. It is emerging today. The story we tell in Book One and the ideas we explore in Book Two are about the extraordinary potential of the ordinary. It is about honoring and uplifting what is already there but hidden and not yet fully realized, so that it can open wide the doorways to the wisdom and compas­sion of community. We invite you to walk with Yasodhara on the shared Path of Right Relation and to become, together with us, relational and spiritual activists in our hurting world.